There are 11 posts tagged Labour (this is page 1 of 3). I don’t very often write posts attacking the Labour leadership – not because I don’t believe the many ludicrous policies of Corbyn & Co need to be opposed, but because the Parliamentary Labour Party (and many grassroots activists) seem to be doing a competent enough job of opposing the opposition themselves. All of us can go through depression; all of us can go through those experiences. Every single one of us in this Chamber knows people who have gone through it, and has visited people who have been in institutions and have fully recovered and gone back to work and continued their normal life. I dream of the day when this country becomes as accepting of these problems as some Scandinavian countries are, where one Prime Minister was given six months off in order to recover from depression, rather than being hounded out of office as would have happened on so many other occasions. We need greater and more effective assessment of the needs of mental health services across London, because there is still a stigma in some areas. Some communities and families are more able to come forward than others. We need to create an atmosphere in which people understand that we can all experience stress and that we all need help at some time in our lives, and the NHS must and should be there to provide that help when it is needed. It was, therefore, pleasing to see Mr Corbyn appoint a Shadow Cabinet Minister for Mental Health in his first cabinet last September. However, the role was short-lived, with the portfolio being scrapped following the swathes of resignations in July. That didn’t stop the newly (re-)elected leader from protesting against the decision to ditch the post at the Labour Party conference today. 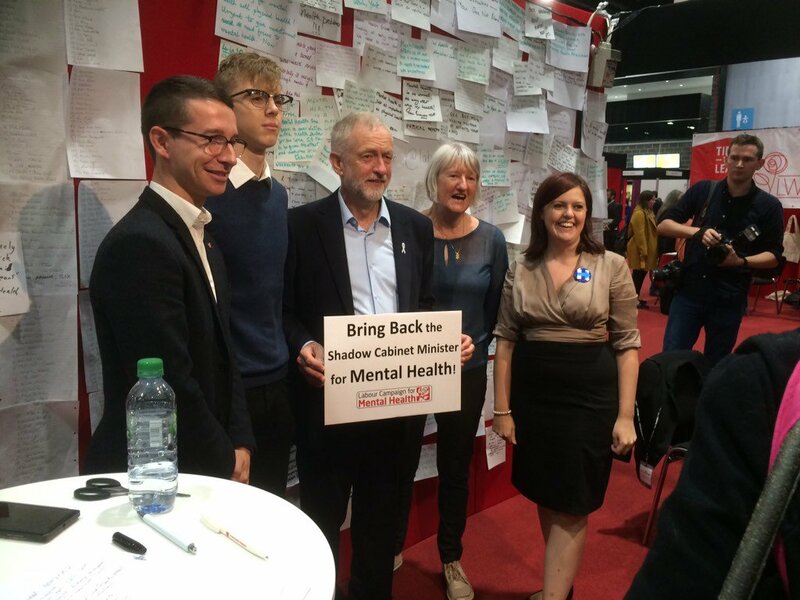 Posing with campaigners for mental health, Mr Corbyn held a sign calling for the reintroduction of the Shadow Cabinet Minister for Mental Health. The post he created himself and then abolished himself! In what was billed as the first electoral test for Labour leader Jeremy Corbyn, the people of Oldham West and Royton went to the polls yesterday to choose the successor to the late Michael Meacher. The veteran MP had served the constituency since 1970 and achieved a majority of over 14,000 in May; anything less than a resounding victory would have been a major blow to an already shaky Labour leadership. The party’s fears during the campaign were, ultimately, unfounded, and Jim McMahon was returned victorious for Labour with an increased vote share. UKIP came a poor second and the Tories, with a meagre 9%, were the only other party to retain their deposit. It seems that there may be questions to ask about irregularities in some of the postal votes – and if any wrongdoing took place then, for the sake of trust in democracy, it must be uncovered and the culprits brought to justice. Do we see the ghost of #ThanetRigged this morning? I may have left UKIP when I moved from the UK, but I do still take a keen interest in the party’s fortunes and I am dismayed at what I have seen since the declaration of the result. From the very top downwards, complaints are being made left, right and centre about the way yesterday’s result was arrived at, while supporters are slapping each other on the back and agreeing with each other’s conspiracy theories. To each other, it may genuinely seem as though there is a broad consensus that something is wildly amiss, but to most detached observers, it often just seems as though the members are looking to blame the election loss on anybody but their own party. Do #ukip voices not realise complaining about "electoral fraud" and "dodgy postal votes" just sounds like #sourgrapes to the rest of us? UKIP is very good at playing the victim, which undoubtedly motivates the troops but, frankly, does not give a good impression to anybody outside the bubble of the party’s membership and core supporters. There is too strong a tendency to blame electoral losses on external factors such as alleged criminal wrongdoing, an establishment plot against the party, etc., without a seemingly genuine examination of what the party itself got wrong. It would have been unrealistic to have expected anything other than a Labour victory in Oldham West and Royton; they were, after all, defending a majority of 14,738, or 34.2%. In May, Michael Meacher was chosen by 54.8% of voters to represent them, compared to then-UKIP candidate Francis Arbour’s 20.6% second-place. What the UKIP base cannot seem to understand, however, was that while the UKIP vote for candidate John Bickley rose by just under three percentage points to 23.4%, Labour’s new Member of Parliament saw his party’s vote increase by almost eight percentage points to 62.1%. While the majority yesterday was lower in terms of the number of votes at 10,722, as it was a by-election and attracted a lower turnout, the percentage majority had actually increased to 38.7%. On the same turnout as in May, that percentage would have equated to an almost 16,700-vote majority. Taking the postal votes away may have reduced the scale of the victory, but the Labour would still have won the seat. 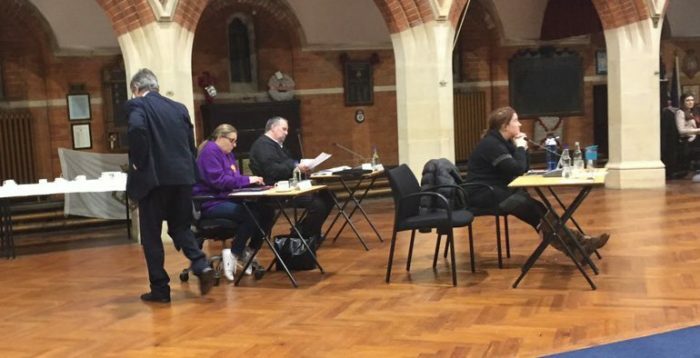 So what went wrong for UKIP? Well, I am not denying that there was not an element of voting irregularity going on simply because I do not know the facts any more than the majority of those supporters who have been jumping up and down on their keyboards. I do agree that a thorough investigation should take place to either confirm that there were no criminal actions relating the the election or prosecute anyone who may have committed a criminal act. Sadly, whilst scrolling through Twitter this morning I was met almost exclusively by sore losers. Those who would rather complain about the result rather than discuss what needs to change in order to build greater support need to wake up to reality: sore losers do not become future victors, they only generate future disappointment. 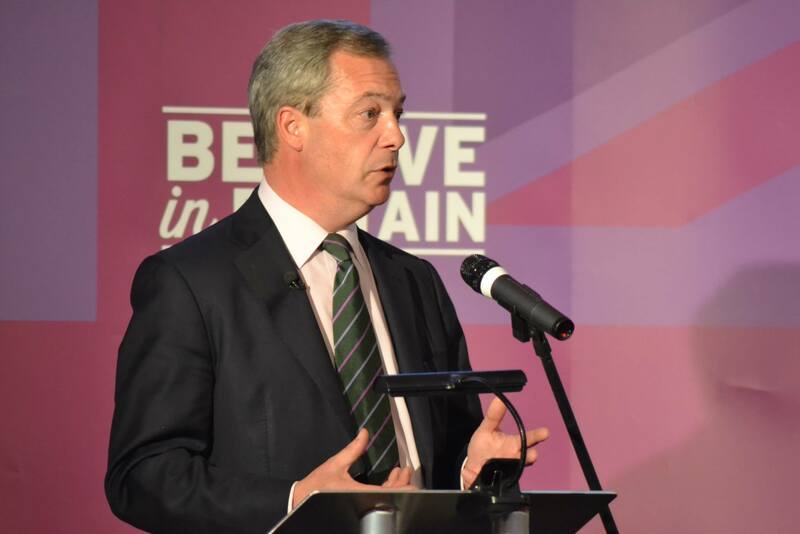 If UKIP members genuinely want to change the direction of the country, they first need to play their own part in changing the direction – and public perception – of their party. To those outside the UKIP bubble, they should appear to be a strong, principled political force with a broad support base and policies which resonate with the wider public. Today, however, they just appear to be little more than sore losers, and failure to recognise that will only hamper the party’s chances of electoral success in the future. In their attempts to discredit the new Leader of the Opposition, some of his political opponents are stooping to incredibly low depths. A service was held today to mark the 75th anniversary of the Battle of Britain. Those present were there to honour and remember those brave men who gave their lives defending the our skies from Luftwaffe attacks. Given my close involvement within the Royal Air Forces Association this is, naturally, something close to my heart. Yet the talking point from today’s service of remembrance seems to be the actions of the Labour Party’s new leader, Jeremy Corbyn. Specifically, the fact that he dared not to sing the national anthem. Now, I’m certainly not a supporter of Jeremy Corbyn, I think much of what he says can be written down and used as toilet paper, but my immediate reaction to this latest “insult” is a resounding “so what?!”. I may not agree with Mr Corbyn on many, many issues, but he is, unlike those candidates he defeated in the race to the leadership, a man of principle. He has campaigned on what he believes in during his 30 years in the House of Commons and hasn’t been afraid to defy the leadership, rebelling over 500 times since 2001. One of the criticisms from his opponents is that he has the gall to stand up for what he believes is right, not what the leadership of the day believes will win them votes. It is difficult for me, as a democrat, to find fault with that. Predictably, it was Conservative MP Sir Nicholas Soames who was wheeled out to make this particular attack. As the grandson of Winston Churchill, it must have seemed that the attack would carry more weight coming from him. Sir Nicholas, who joined the House of Commons on the same day as Mr Corbyn, said that his silence had been “very disrespectful to the Battle of Britain pilots who gave their all”. Disrespectful to the Queen, maybe, but to the Battle of Britain pilots who gave their all in defending the free society we still enjoy today, thanks to them, it most certainly is not. Mr Corbyn is, as far as I am concerned, as free to decline singing praise to the sovereign if it is against his beliefs as I am to criticise every ludicrous policy he may concoct and promote. The brave Battle of Britain pilots fought to defend our freedom, and making use of that freedom, even in a service of remembrance honouring them, is most certainly not being disrespectful to them or their memories. Jeremy Corbyn, as leader of the Labour Party, is about to start proposing a number of policies that could damage Britain, and everyone who believes in Britain (even those of us who have moved abroad…) should make the potential damage clear before he wins any real power. However, political opponents and the media alike seem to be focusing on Jeremy Corbyn the man, rather than his policies, and look set to scrape the bottom of the barrel and try to make their personal attacks even more vicious than those against Ed Miliband. By all means, attack the many crazy policies Mr Corbyn has, but attacking him personally, especially (absurdly) for being true to his beliefs, will only drive those who are fed up of the current style of politics into Mr Corbyn’s outstretched arms, and make the prospect of seeing his dangerous policies put into practice ever more likely.